If you have questions, please view our Frequently Asked Questions. Then, when you’re ready, fill out the form below to give us permission to feature your video and notify us that it has been uploaded. *Those under the age of 18 wishing to submit a video may have a parent or legal guardian submit in their behalf. Do I need to be Mormon? Everyone is invited to join in this effort to sing the praises of Jesus Christ's Resurrection! It does not matter if you are LDS, Catholic, Baptist, or another denomination—you are invited to participate. You can even reach out to your church choir and help them create and upload a video, if you want. The purpose of this Easter initiative is for Christians from around the world to come together to sing praises and proclaim that Jesus Christ the Messiah lives! This effort is an Internet phenomenon where thousands of people record themselves singing a song, they all upload their videos to YouTube, and the uploaded voices of those singing are combined into a choir! 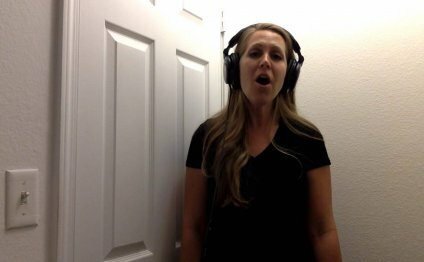 A man named Eric Whitacre started the virtual choir trend, and he is the inspiration for this Virtual Hallelujah Chorus. This sounds fun, but I am not trained in singing. Can I still participate? The Lord has said, "For my soul delighteth in the song of the heart; yea, the song of the righteous is a prayer unto me, and it shall be answered with a blessing upon their heads" (D&C 25:12). He did not say that only the trained vocalist's song or the perfect tenor's song is acceptable; it is the song of your heart that pleases the Lord. And so everyone is welcome to join the Mormon Tabernacle Choir for this project. It does not matter your level of talent or training. To help you get started, Peter and Evynne Hollens, who are both trained singing professionals, have produced videos to help you practice. You must be 18 years old to upload the video to YouTube, or 13 years old with consent from a parent or guardian. (see the YouTube Terms of Service, item 12). The Content Submission Agreement that follows on this page states you must be 18 years old or older to submit a video. *Those under the age of 18 wishing to submit a video through this page may have a parent or legal guardian submit in their behalf. From a desktop or laptop computer, follow the directions found on this webpage. The easiest way to upload videos from Androids and iOS devices is to use the YouTube app. Tap the Accounts tab, and select My videos. Tap the Upload icon at the top of the screen. Fill in the title and description and adjust the privacy settings of your video. On supported devices, you will also see a video preview with trim handles below it. Drag the trim handles to edit your video's length. A long press on the trim handle will allow you to zoom into a frame-by-frame view for exact trimming.